Nostalgia abounds! Ganesh Chaturthi is around the corner. Exquisitely crafted Ganeshas, displayed with pomp, in the street pandals are now a thing of the past. I miss the boisterous gaiety and communal celebrations that erupt all over India, this time of the year. Ganesha Chaturthi is as much about celebrating the elephant-headed God as it is about cultural pagentry rooted in artistic traditons. And today, I want to present to you a dear friend’s artistry – DIY Ganeshas. Aalayam readers – here is another attempt to inspire you to live your best life! 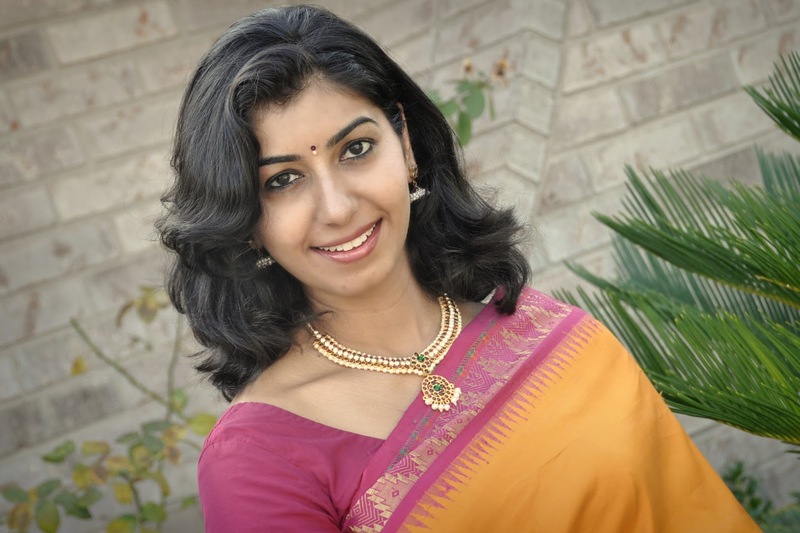 Meet Sowmya Balasubramani - an inspiration in her own right! Her larger-than-life spirit and enthusiasm makes her a vanguard of a new age of Indian women – an everyday inspiration! I don’t know anyone else who celebrates Indian festivals with as much ardor as does Sowmya – decorating, cooking, sharing her observance with friends and family – the whole nine yards! It is not easy, time and effort constraints always get in the way! Sowmya does it – every single time! Possibly dipping in to her wellspring for energy or perhaps looking past the constraints through a different grid and for this I doff my hat! 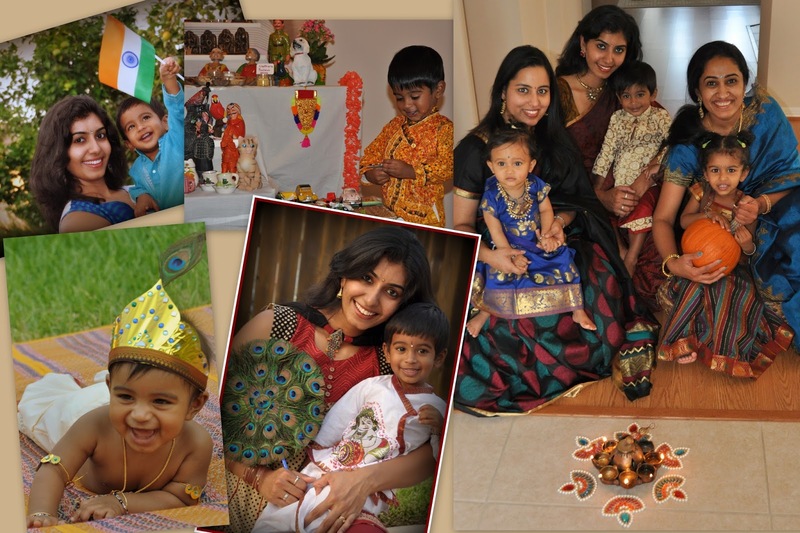 The pictures in the post are rife with Sowmya's zest for cultural jubilation! I want to kick start this festive season with an introduction to Sowmya, her maxim for celebrating Hindu festivals and her awe-inspiring DIY Ganeshas. Buckle up, as I take you on another visually inspiring cultural voyage! I am a happy go-lucky gal that loves to live life king size. An architect by profession, I am now enjoying being a full time mom to my super busy 2 year old. While dance and music feed my soul, crafting lifts my spirits. Running is my latest passion and after 3 half marathons, I have realized that it’s the adrenaline rush that keeps me motivated. I enjoy camping, theater, good books, good food but most of all the company of my awesome family and friends! 2) You celebrate every festival with so much buoyancy - how come? I think its is something that we started in our own home post-marriage. My parents always celebrated festivals but I guess I was too busy being a teenager to bother! Once I came here to the US, I felt a strong desire to connect with my roots. Celebrating festivals allowed for that and gave me a medium to satiate my creative thirst. Also, it became a great way showcase our rich Indian culture to people from other parts of the world. Oh and of course hanging out with friends and celebrating togetherness was a bonus! 3) What does celebrating a festival mean to you? Anyone who knows me will tell you I am a cleanliness “freak “. So, the house cleaning part is the inherent plus ;). I think I like it most for the joyous gatherings, dancing, singing and of course the good food. On a more serious note, I have learnt things about my religion that I never knew before. I wouldn’t call myself a very religious person, yet I am proud of my religion and like the idea of being able to explain Hinduism to people who are interested to know about it. Many a time, I have actually done some homework to be able to answer questions that I wasn't sure of. The learning process has been enriching! I have received several dolls from different parts of the world to add to my golu from loving friends. It has been the most humbling part of this experience! Sowmya enlists friend and family to help out with the festivities! 4) You are a parent - talk to me about the challenges of raising a kid in a multicultural background - what is your own mantra? Everybody has one! Honestly ,I don’t know the answer to this one. I just do the best I can to teach my child everything I know about my religion and culture. However, I make a conscious effort to introduce him to other cultures and religions as well. I have grown up with utmost respect for all religions and cultures and hope to pass that on to my son. 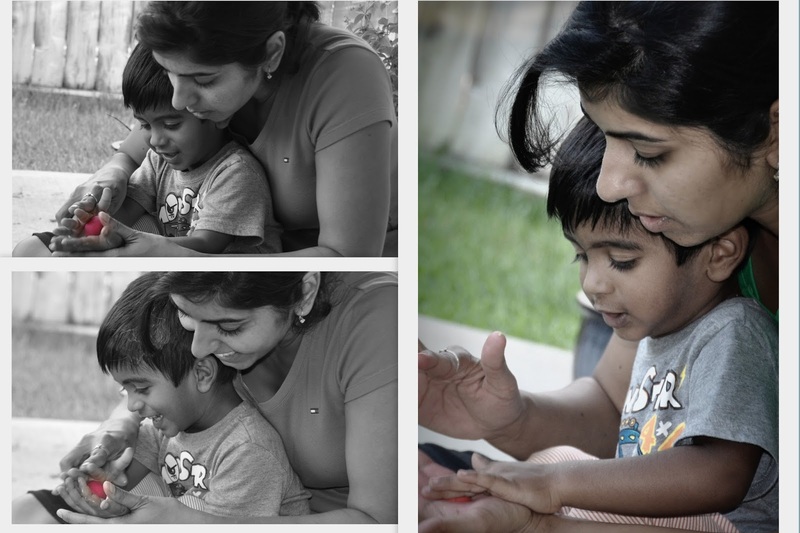 Sowmya worked on a play-doh Ganesha with her adorbale little boy Darsh this year and here is what she wrote, "This year I decided to include my two year old in the Ganesha-making process. We made a very simple Ganesha with playdoh. I talked about the different colors, shapes and parts of the body. He was co operative and participated for a bit and I ended up making most of it. However, the curiosity and the excitement on his face when he saw the finished product was very sweet. He wanted to hold it in his hands and even handled it with care and even declared that it was his Ganesha...so worth the effort! Try this with ( or without) your little one. This Ganesha may be small in size and minimal in detail but will surely bring big time cheer to your festival." Talking about her parenting mantra, she adds, " Something I read recently has stuck in my brain- before you lose sleep over trying to raise a good child, remember that you were blessed with a good child to begin with”. 5) Time is always a limiting factor - what are your must-do's for a festival? You seem to do it all ! It helps when your friends (and spouse of course) are as enthusiastic about the whole thing as you are. Whether it is making the Ganesha, setting up for Golu or celebrating Diwali, my friends always help. We try and do different festivals at different homes. Everyone gets a chance at hosting. I guess that is ultimately what a festival is about- sharing and caring. It is also a time for indulging so I use it as an excuse to make sweets and savories. Of course, it does require some planning. I try and spread things over a week or so before the festival; it helps me get in the spirit and is less overwhelming. 6) Where do you draw your inspirations for décor from? 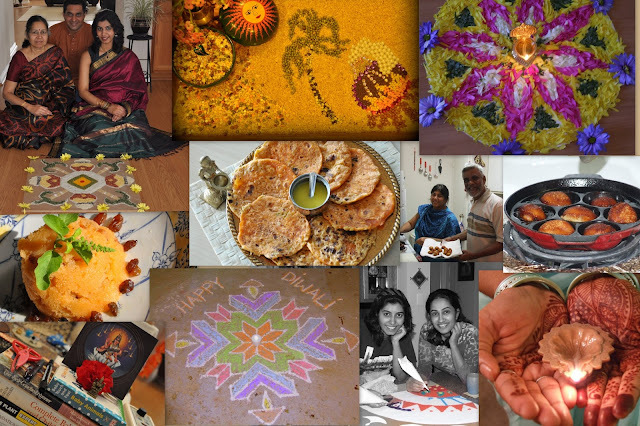 Not many resources on the www are dedicated to Indian festival decorating - any sites you would like to refer Aalayam readers to? I don’t really refer to a particular website to decorate for my festivals. Usually, I try and go with a certain color or find one striking decorative piece and try and plan things around it. I like big, bold and lots of color! 7) Your home made Ganeshas are phenomenal and rightly capture the essence of the festival of Shraddha and Bhakti- How did you start making your own Ganeshas and where does the inspiration for these come from? I had been celebrating Ganesha Chathurthi before this and was buying a Ganesha every year; the idea to make it was actually my friend Thrushna’s. Inspiration…. hmm. The first couple of years our aim was to make an idol that would stand and look proportionate. 2 years ago we decided to make the ABC Ganesha as a tribute to the English language. 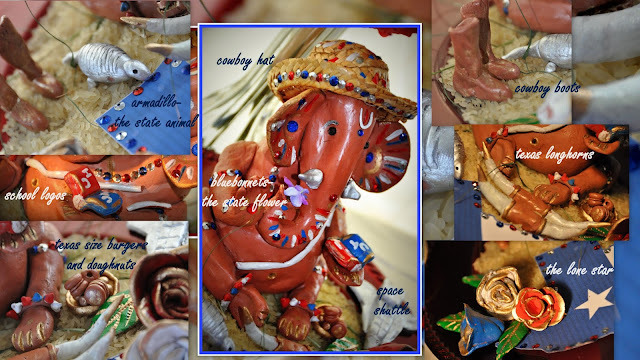 The following year was the Texan Ganesha as a tribute to the state that is our home now. 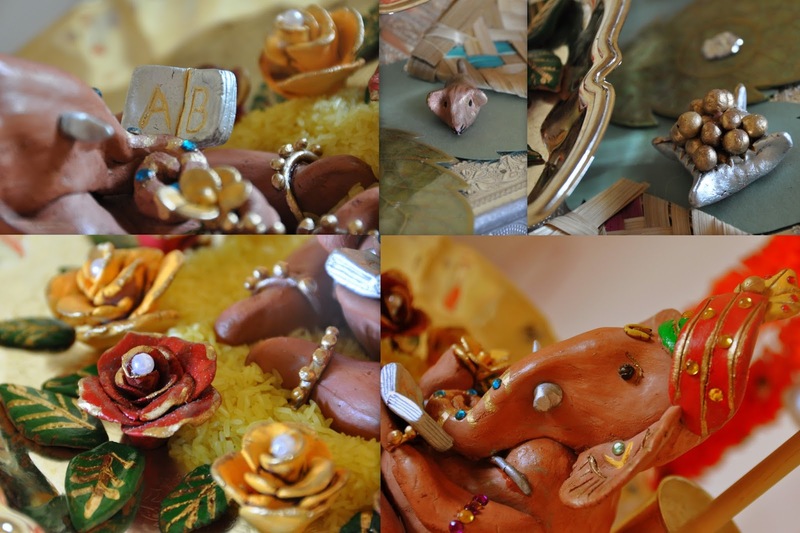 Our spouses, Kishore and Manju have been great at adding their details and touches to the Ganesha. Their ideas have been awesome of course but it is the entertainment in the form of their silly antics and jokes that are priceless. Giving the elephant headed God life! 8) Lastly, a word of advice for young working moms on how to go about handling Hindu festivals, perhaps? Firstly, don’t bite off more than you can chew. You don’t have to do it all if you don’t have the time. Do as much as you can and build on it when possible. Hand make a few things and buy a few. It will give you the satisfaction of having done something on your own without losing your sleep over it. Try and build a circle that you can do things together with -makes it easier and more enjoyable. Think of this as a fun way to teach your kids and neighbors a bit about your culture and the amazing land you come from! Lastly, never forget to dance, sing, laugh and eat your heart out! Wise words indeed! 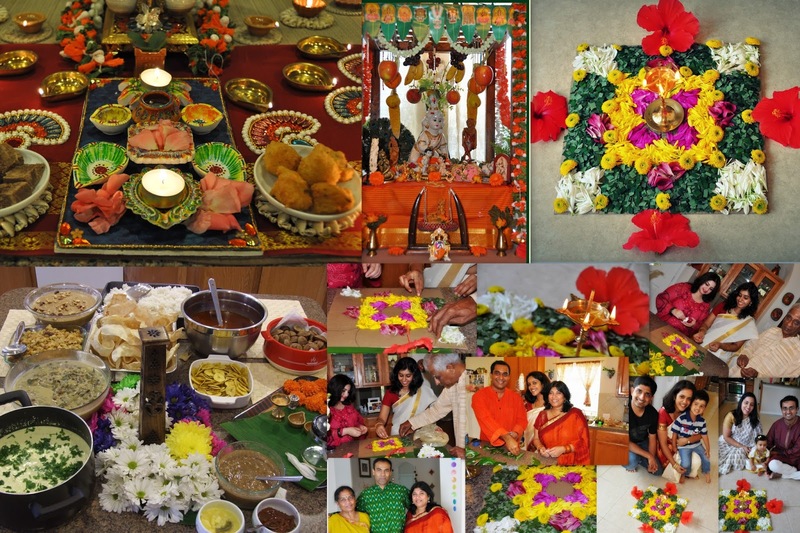 Thank you Sowmya - for sharing your precious Ganeshas and your interminable fervor with us! I hope your vitality inspires all of us! 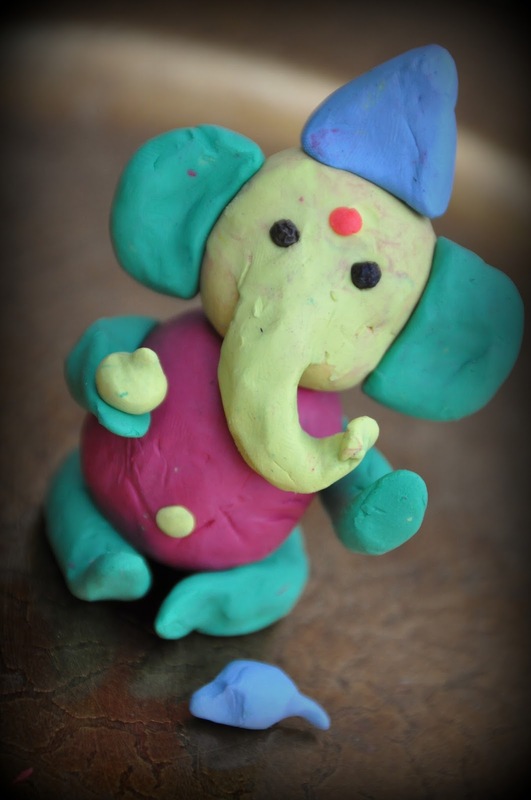 Isn't the play doh Ganesha replete with modakam and mooshikam simply darling? Hope Sowmya’s sui generis Ganeshas engender many creative ideas for your own festivities this season. Stay with us for more ideas and more inspirations - Dussehra, Diwali... we are only getting started! Sahana: It was a lot of fun collaborating with Sowmya and I have always admired her zest for observing festivals and it was a pleasure to showcase this enthusiasm. Thanks for reading! Stay tuned - more exciting posts coming your way this festive season! A very well written and a timely article. With Ganesha festival around the corner this article is really inspiring in its own way. Thanks to Sowmya for sharing her views and ideas about celebration Indian festival and her Ganesha making skills. I also second her thoughts about picking a festival( select one in a year and hosting it) and celebrating the same with elaboration, instead of trying to do all of them for the sake of it. Kudos to Aalayam (Deepa and Supriya) for selecting the right topic around this time of year. It for sure inspired me to celebrate this year's festival with friends and family with lots of enthusiasm. Hope we could celebrate the festival together this year Deepa! looking forward for one in future. U girls rock ! keep writing!!!! Kavitha: Thank you for your wonderful comment!We came out with this post early in the hopes of getting Aalayam readers into the spirit of the festival season.Indeed, thanks to sowmya for sharing personal pictures of her celebrations with all of us. Stay tuned, Aalyam will soon feature "Weaves of India" in time for the upcoming festivities! My Dearest Friend and sis always was and always will be an inspiration! Div: Thanks for reading! It was a pleasure collaborating with Sowmya for this. Inspiring!! Not just for the working moms, but for every creative mind with a willing mindset. And for those who lack the 2nd part, sowmya's advice on how one can make it happen, is really priceless. Abhi: Thank you for your comment. Sowmya is an inspiration. Great take away lessons here. We would love for you and your friends to be a part of the Aalayam family! Shashi: Sowmya will appreciate your kind words. Thank you for reading and commenting. I have always associated her with positivity and to showcase this spirit was a pleasure! If you like the other posts featured on Aalayam - stay tuned, we have so much more planned for the upcoming months! Way to go Sowmya! The ganeshas are very cute. Many people have talent, but hats off to your commitment to get the job done without compromising on the aesthetics. Also, kudos to the team that's put together the feature. Very nicely done. Thank you Karthik! Indeed, it takes commitment and a willingness and Sowmya's story tells us that it can be done! I had fun putting this feature together! beautiful work on the Ganeshas Sowmya! especially involving the kids and family makes it more special. I still remember my childhood days where the family gets together to build the crib for X'mas making it so special for the each of us. The same way the addition of personalized touch to the festivities makes it more special and an event to remember and cherish for many years to come. staying away from home brings its own downfall too, especially during the holiday season, where you miss all the festivities, the hustle and the bustle but its wonderful involving friends and make this festival more a more enjoyable one!! Good work on keeping the festive spirits although your home away from home, but still so close when you celebrate it together! Maria : I am sure Sowmya is touched by your comment as I am with you taking the time to read. Indeed, we all have our fond memories tied to our unique personal traditions and the festive season is a great time to reminisce and recreate the childhood magic. If I say top 10 people who inspired my life, Sowmya is one among them. The type of inspiration and confidence she had given me, made me to run 13.1 miles in Marathon with just3 weeks practice. I have seen so many big houses but again the Sowmya’s house is one among the best 5 homes I have ever seen. Supported by such a great Mom and Dad, a husband like Kishore, it is so amazing to see the way she handle all her extra-curricular activities and Darsh. People like you are “THE POISTIVE ENERGY” in this world Sowmya……. Remasankar : Indeed, I've only known sowmya for a relatively short time and yet I can vouch for her positive attitude and her interminable zest! You are very welcome Archana. Infact, I should be thanking Sowmya once again for this feature which so man of our readers seemed to enjoy! I am looking forward to seeing sowmya's rendition from this year! Thanks for reading. Please do join the Aalayam family. I am loving your space here,and the way Indian festivities are featured here with such fine detailing visually and in words.I am your newest follower.Would really love it,if you would drop by mine. Arani: Hello and welcome and thank you! we love feedback from our readers and your comment puts us on cloud nine! will stop by your space soon. Very well written! Beautiful pics.. Awesome space! Sowmya most definitely is an inspiration to many.. And I am one of those fortunate ones.. She reminds us of what is most imp in life and how it is easy to make time and beautiful memories with our loved ones! I look forward to her pictures/post as they inspire me a lot! PS: I also just read your latest write up on sarees. So useful. I didn't know all that and feels good to now know! Thank you for sharing! Suma: Thank you for your well articulated comment. Please do join the Aalayam family and help us grow our tribe! We are going to feature so many wonderful posts this festival and holiday season.